Bubbles (born April 30, 1983) is a common chimpanzee once kept as a pet by American singer Michael Jackson, who bought him from a Texas research facility in the 1980s. Bubbles frequently traveled with Jackson, leading to media mockery and a public perception of Jackson as eccentric. During the Bad world tour, for example, Jackson brought Bubbles to Japan, where they drank tea with the mayor of Osaka. Bubbles was initially kept at the Jackson family home in Encino, Los Angeles, but was moved to Neverland Ranch in 1988. There, he slept in a crib in Jackson's bedroom, used Jackson's toilet and ate candy in the Neverland movie theater. By 2003, like many captive chimpanzees, Bubbles had matured into a large and aggressive adult chimp unsuitable as a companion animal, and was sent to a California animal trainer. When the trainer closed his operation in 2004, Bubbles was moved to the Center for Great Apes, a sanctuary in Wauchula, Florida, where he has lived since 2005. Bubbles was born in early 1983 in an Austin, Texas, research facility that bred primates for animal testing. There are conflicting reports as to how he came into Jackson's possession; many state that Jackson had purchased him when he was eight months old. The acquisition was said to have been supervised by Bob Dunn, then one of Hollywood's most famous suppliers and trainers of animals for films, photoshoots and advertisements. Bubbles was kept at the Jackson family's Encino home until 1988, when he was moved to Jackson's newly acquired Neverland Ranch. Bubbles slept in a crib in Jackson's bedroom, ate candy in the Neverland movie theater, was fed at the dining table, wore a diaper, and used Jackson's personal toilet. At Jackson's 2005 trial, jurors learned from a videotaped interview with Jackson that his chimpanzees would help him with housekeeping chores. "They run around, help me clean the room. They help me dust, clean the window," Jackson stated. Jackson's housekeepers testified that they disapproved of the chimpanzee behavior. One housekeeper told of how she had to clean feces hurled at the bedroom wall. Another described a chimpanzee tearing off his diaper before crawling into Jackson's bed. The public perception of what Michael is as a human being has been highly exaggerated. Those articles are hard for me to relate to. For instance, Bubbles is more fun than a lot of people I know. I saw Bubbles at a wedding in a tux. He has great table manners. According to journalist Steve Huey, Bubbles formed a public perception of Jackson as a "bizarre eccentric, obsessed with recapturing his childhood". According to Robert Thompson, professor of popular culture at Syracuse University, "This is when the weirdness began to reach mythic proportions." Jackson and Bubbles' bond, as well as Jackson's other alleged eccentricities, contributed to the media nickname "Wacko Jacko", which Jackson came to despise. The media often focused on Bubbles, rather than Jackson's music, and published false stories, such as the allegation that Bubbles was not a single ape, but one of several. A later claim suggested that Bubbles had died; Jackson's press agent Lee Solters quipped to the media that "when Bubbles heard about his demise he went bananas ... Like Mark Twain, his death is grossly exaggerated and he's alive and doing well." The media also reported that Bubbles would be the ringbearer at Elizabeth Taylor's October 6, 1991, Neverland Ranch wedding; the report was untrue, but was, according to The New York Times, "an idea that some newspapers found too delightful not to report." Another story, reported in The National Enquirer, claimed that the musician Prince, Jackson's longtime rival, had used extrasensory perception to turn Bubbles crazy. According to the story, Jackson said: "What kind of sicko would mess with a monkey? This is the final straw. Poor, poor Bubbles." Jackson found the story hilarious; his staff reported that they had never seen him laugh so much. Michael Jackson had Bubbles accompany him throughout the late 1980s. The late 1980s were a busy period for Bubbles. Jackson took him on outings and would often talk to him. According to reports, he showed him how to moonwalk. Bubbles had an agent and was rumored to have his own bodyguard. He sat in for the recording of the Bad album— Jackson insisted that Bubbles and Jackson's pet snake attend as spectators—and accompanied Jackson for the filming of the "Bad" music video. In the short film for "Liberian Girl", Bubbles made a cameo appearance. When the Bad world tour began in September, 1987, he and Jackson shared a two-bedroom hotel suite in Tokyo. During the tour, Bubbles and Jackson made a social visit to the Mayor of Osaka, Yasushi Oshima; there, Bubbles drank Japanese green tea while seated quietly next to Jackson. Oshima said that he and his fellow officials were "surprised to see the chimpanzee, but we understand he is [Michael's] good friend ... This is the first time an animal ever entered City Hall." Though allowed to travel to Japan, Bubbles was unable to enter Britain and Sweden due to strict quarantine laws. Jackson also brought Bubbles for tea at Elizabeth Taylor's house. Taylor did not mind the fact that Jackson had brought a chimpanzee. At a party to celebrate and promote Bad, Bubbles reportedly "worked the room" and was "the life of the party". Around this time, Bubbles and Jackson were photographed by Kenny Rogers for his book, Your Friends and Mine. The photo shows Bubbles held on Jackson's hip, and has been cited as one of the best taken of Jackson. [by whom?] In the black and white photograph, Bubbles is dressed casually in a long sleeved shirt and overalls. Jackson is also dressed casually; he wears jeans and a simple shirt. Rogers said: "Bubbles was so human it was almost frightening. He would take Christopher [Rogers' son] by the hand, walk over to the refrigerator, open it, take out a banana and hand it to him. Christopher was amazed... we all were." In the 2003 documentary Living with Michael Jackson, Jackson told journalist Martin Bashir that Bubbles had become pugnacious. He was moved to an animal sanctuary over fears he might attack Jackson's newborn son, Prince Michael II. [nb 1] Jackson bought two more baby chimpanzees, Max and Action Jackson; the public believed these chimpanzees were also Bubbles. Bubbles' removal was a source of regret for Jackson, who stated that chimpanzees could live for up to 60 years. During the interview, Bashir was also told of how Jackson had planned to hold a "celebrity animal party" for Bubbles. Cheeta, the chimpanzee from Tarzan, Benji and Lassie were to be invited. Bubbles was relocated to Bob Dunn's ranch in Sylmar, California. "Bubbles is an adult chimp and a wild animal," Dunn stated at the time. "We don't let him out to play." According to CNN, Jackson and his children visited Bubbles, and also played with the other animals at the ranch. "[Jackson] still acts like a kid around them", Dunn said. The Washington Times, however, claimed Jackson did not visit Bubbles, despite Jackson's representative having stated that he would like to meet him again. Shortly afterward, in December 2003, it was claimed that Bubbles had attempted suicide. [nb 2] He was supposedly taken to a hospital in time to be saved. Since the closure of Dunn's facility in 2004, Bubbles has been kept at the Center for Great Apes in Wauchula, Florida, where he is said to enjoy painting and listening to flute music. The center for apes, where the annual care for each animal costs around $17,000 as of 2009, also houses 41 other chimpanzees and orangutans. Patti Ragan, director for the Center for Great Apes, commented on the animals' daily routine at the sanctuary. "They relax. They take naps together. They might go up in the top of the cupola. They go out in the chutes and lie under a tree in the tunnel system. They groom each other and they fight and they have arguments, too." According to animal keepers at the center, the 160-pound (73 kg) Bubbles—whose facial features have changed since his time with Jackson—is now "huge and ugly" but has a "sweet character". In 2009, the ape was spending most of his time sitting quietly in trees with Sam, a 40-year-old chimpanzee. On June 25, 2009, Jackson died at the age of 50, after suffering a cardiac arrest. News organizations reported that Bubbles was not brought to Jackson's memorial service. It has not been revealed whether Jackson left money to support Bubbles, whose care, to date, has been paid for by public donations. Animal trainer Dunn, speaking to the News of the World, said: "Bubbles definitely missed [Jackson] when they parted and will miss him now. Chimpanzees are intelligent. They remember people and stuff. Bubbles and Michael were close friends and playmates. The last time Michael visited, Bubbles definitely recognized and remembered him. "[nb 3] He said that Jackson thought of Bubbles as his first child, and added that he hoped Jackson's children would keep in touch with their "stepbrother" following their father's death. In 2010, Jackson's sister La Toya visited Bubbles at the Center for Great Apes in Florida. Jackson launched Michael's Pets, a range of soft toys based on the animals he owned, in November 1986. The toys consisted of a frog, dog, rabbit, snake, ostrich, giraffe, llama and Bubbles the chimp. Jackson also appeared, as a bear wearing sunglasses and a fedora. 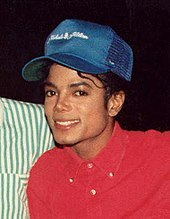 "He [Jackson] was very instrumental in designing the toys", said Bob Michaelson, who was responsible for developing them. "He was very instrumental in how it should be programmed... he's got tremendous intuition." Jackson, in approving the toys, stipulated that the manufacturers donate $1 per sale to a children's charity. In 1988, the artist Jeff Koons made three identical porcelain sculptures, Michael Jackson and Bubbles, as part of his Banality exhibit. At the time, each sculpture was said to be worth $250,000. Koons once said: "If I could be one other living person, it would probably be Michael Jackson." The piece became one of Koons' best known works. The figure shows Jackson and Bubbles wearing gold military-style suits. In 2001, one of the figures was put up for auction and was expected to fetch between $3 million and $4 million. The figure sold to an anonymous telephone bidder for $5.6 million, a record for a work by Koons. Two of the sculptures are housed at The Broad Contemporary Art Museum in downtown Los Angeles and the San Francisco Museum of Modern Art. Behind his seemingly-perfect life of glamorous friends, gold-plated tyre swings, and personal chefs, there is a dark history of medical experiments, addiction and loss. But Bubbles has fought against his personal and professional problems and, with his help of man-pet Michael Jackson, he has grown to become bigger than King Kong—figuratively speaking. ^ Primatologist Jane Goodall writes that while some chimpanzees may seen "cute, funny and even lovable", to think that they would make good pets is inaccurate. She notes that at about 6 to 8 years of age, the animals become strong and indocile. ^ Reports on "animal suicide" can be traced back decades. While there is no consensus on the topic and modern naturalistic studies have found little evidence of self-harming behaviour among nonhuman species, it has been noted that there are "strong cross-species parallels" and that traits linked with suicide in humans have been found in rodents. Author You-Sheng Li wrote in a 2005 book that it was doubtful that chimpanzees have the mental capacity to attempt suicide. She added that some animals, however, may give up their lives in certain circumstances. ^ Jane Goodall notes that chimpanzees become more relaxed around individuals they recognize. ^ a b c d e f g "Bubbles the Chimpanzee - Center for Great Apes Resident". Center for Great Apes. Archived from the original on May 25, 2013. Retrieved February 19, 2013. ^ a b c d e Allen, Nick (July 3, 2009). "Bubbles the Chimp not invited to Michael Jackson's funeral". The Daily Telegraph. London: Telegraph Media Group. Retrieved July 25, 2009. ^ a b c d e Segal, Kim; Zarrella, John (July 2, 2009). "Jackson's chimp Bubbles enjoys life out of public eye". CNN. Time Warner Inc. Retrieved July 25, 2009. ^ Ayres, Chris (March 24, 2005). "What does Hollywood do when a screen chimp turns nasty? Shoot it dead and call in a cartoon". The Times. London: News Corporation. Retrieved February 2, 2010. ^ "Michael Jackson joins the over-30 crowd". Deseret News. Deseret Management Corporation. August 29, 1988. Archived from the original on July 4, 2009. Retrieved April 3, 2009. ^ a b c d e f Goldberg, Michael (September 16, 1987). "Is singer Michael Jackson for real?". Deseret News. Deseret Management Corporation. Retrieved April 3, 2009. ^ a b "Monkey business in the loo". The Sydney Morning Herald. Fairfax Media. May 12, 2005. Retrieved April 3, 2009. ^ Huey, Steve. "Michael Jackson biography". MTV.com. MTV Networks. Archived from the original on August 4, 2012. Retrieved April 3, 2009. ^ Leung, Rebecca (November 22, 2003). "Behind The Mask". CBS News. CBS Corporation. Retrieved April 3, 2009. ^ Martin, Douglas (May 21, 2009). "Lee Solters, Razzle-Dazzle Press Agent, Dies at 89". The New York Times. The New York Times Company. Retrieved July 25, 2009. ^ "Pop star's chimp is alive and well". Gadsden Times. The New York Times Company. January 24, 1990. Retrieved February 3, 2010. ^ Mydans, Seth (October 7, 1991). "California Journal; Liz Taylor's 8th: Old Role, New Lead". The New York Times. The New York Times Company. Retrieved April 3, 2009. ^ Lartigue, Michael J. "Is Michael Still a Thriller?". The Harvard Crimson. Harvard University. Retrieved April 3, 2009. ^ Barnes, Ken (September 10, 2001). "Michael: Thrilling, bad, dangerous and more". USA Today. Gannett Company. Retrieved April 3, 2009. ^ "Just Who Was Bubbles, Michael Jackson's Famous Chimp?". MTV. Viacom. June 26, 2009. Retrieved June 28, 2009. ^ "Chimp's tea party" (Payment required to access full article). Toronto Star. Torstar. September 20, 1987. Retrieved February 3, 2010. ^ Wire, From (September 19, 1987). "People" (Payment required to access full article). The Dallas Morning News. A. H. Belo Corporation. Retrieved February 3, 2010. ^ "Tour goes on without chimp". Rome News-Tribune. News Publishing Company. June 30, 1988. Retrieved July 25, 2009. ^ "Sorry Bubbles, you have to stay home". Boca Raton News. South Florida Media Company. March 12, 1988. Retrieved July 25, 2009. ^ Ayres, Chris (February 8, 2005). "Neverland, or Iraq? That's an easy one. Hand me that flak jacket, will you..." The Times. London: News Corporation. Retrieved April 2, 2009. ^ Goodall, Jane (February 25, 2009). "Loving chimps to death". Los Angeles Times. Tribune Company. Retrieved February 4, 2010. ^ Flett, Kathryn (February 9, 2003). "Bashir'd, but not beaten". The Guardian. London: Guardian Media Group. Retrieved August 1, 2009. ^ Elsworth, Catherine (May 13, 2005). "Like Princess Di, my love for children is pure, says Jackson". The Daily Telegraph. Telegraph Media Group. Retrieved August 21, 2009. ^ a b c d Miller, Samantha (July 29, 2002). "Michael Jackson may face a cash crunch". CNN. Time Warner Inc. Retrieved April 2, 2009. ^ "Taking Names". The Washington Times. News World Communications. July 1, 2009. Retrieved August 28, 2009. ^ "Animals that commit suicide". Pittsburgh Press. E. W. Scripps Company. October 5, 1919. Retrieved February 2, 2010. ^ Preti, Antonio (2005). "Suicide among animals : Clues from folklore that may prevent suicidal behaviour in human beings". Psychological Reports. Psychological Reports, Missoula, MT, ETATS-UNIS (1955) (Revue). 97 (2): 547–558. doi:10.2466/pr0.97.6.547-558. ISSN 0033-2941. PMID 16342583. Retrieved February 2, 2009. ^ Malkesman, Oz; Pine, Daniel S.; Tragon, Tyson (April 2009). Austin, Daniel R.;, Henter, Ioline D.; Chen, Guang; Manji. Husseini K. "Animal models of suicide-trait-related behaviors". Trends in Pharmacological Sciences. Elsevier Ltd. 30 (4): 165–173. doi:10.1016/j.tips.2009.01.004. PMC 2788815. PMID 19269045. Archived from the original on 2013-02-02. Retrieved February 2, 2010. ^ a b c Copping, Jasper (June 28, 2009). "Michael Jackson: pet chimpanzee Bubbles pines for former owner". The Daily Telegraph. London: Telegraph Media Group. Retrieved June 28, 2009. ^ a b "And misfortune strikes MJ". The Times of India. Bennett, Coleman & Co. Ltd. December 23, 2003. Retrieved April 2, 2009. ^ "Singer Michael Jackson dead at 50-Legendary pop star had been preparing for London comeback tour". MSNBC. NBC Universal, Inc. June 25, 2009. Retrieved June 25, 2009. ^ "La Toya & Bubbles Reunited". National Ledger. June 24, 2010. Retrieved June 27, 2010. ^ Well-known celebrities help little-known causes. Jet. Johnson Publishing Company. May 6, 1985. Retrieved August 21, 2009. ^ a b c d Bennett, Will (June 5, 2001). "Mystery buyer pays £4m for golden vision of Jackson and his chimp". The Daily Telegraph. Telegraph Media Group. Retrieved April 2, 2009. ^ Dewan, Shaila K. (June 6, 2000). "No Walking, Just Watering for This Puppy". The New York Times. The New York Times Company. Retrieved April 2, 2009. ^ "Art foundry flounders after sculptor's suit". Central Penn Business Journal. Journal Publications, Inc. March 27, 1998. ^ Rohleder, Anna. "Trouble Ahead For Art Market". Forbes. Forbes. Retrieved April 2, 2009. ^ Multimillion-dollar sculpture. Jet. Johnson Publishing Company. June 4, 2001. Retrieved August 21, 2009. ^ Mason, Christopher (May 20, 2001). "That Cool, That Suit: Sotheby's 007". The New York Times. The New York Times Company. Retrieved April 2, 2009. ^ a b c d Irvine, Chris (August 5, 2009). "Bubbles the chimp to 'publish' tell-all memoir about Michael Jackson". The Daily Telegraph. London: Telegraph Media Group. Retrieved August 15, 2009. Anderson, Christopher P. (1994). Michael Jackson Unauthorized. Simon & Schuster. ISBN 978-0-671-89239-5. Goodall, Jane (2000). Through a Window: My Thirty Years with the Chimpanzees of Gombe. Houghton Mifflin Harcourt. ISBN 978-0-618-05677-4. Li, You-Sheng (2005). A New Interpretation of Chinese Taoist Philosophy: An Anthropological/Psychological View. Taoist Recovery Centre. ISBN 978-0-9738410-0-8. Rees, Dafydd; Crampton, Luke (1991). Rock Movers & Shakers. Billboard Books. ISBN 978-0-8230-7609-3. Warner, Jay (2006). On this Day in Black Music History. Hal Leonard Corporation. ISBN 978-0-634-09926-7.